Once the temperature drops outside then you can take these extra precautions to ensure that your pipes don’t freeze. Close Your Garage Doors: Keep the winter weather at bay. Make sure that you close your garage door during the winter and keep it closed as often as possible to keep your water supply lines in your garage running. Open Your Kitchen and Bathroom Doors: Opening the cabinet doors underneath your sink in both your kitchen and bathroom will help warm air circulate where it matters. 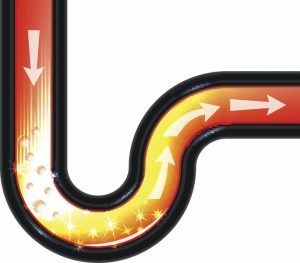 When the doors remain closed through the colder months they only receive cold air on a closed loop—opening the door allows heat to reach these pipes and keeps them flowing. Run Your Water: The best way to prevent a pipe from freezing is to let a little water run just at a trickle. Doing this allows the faucet to remain open and relieve pressure from the system so the pipe won’t burst. Rely on Your Heater: Keep your heat on. We know that you might want to turn down or turn off your heater in winter, but now really isn’t the time if you want to keep water flowing through your pipes. Make sure that the heat remains on in your home, it doesn’t have to be high, but try to keep your home above 50°F so that your pipes never get too cold. Plan for Trips: If you’re flying south for the winter make sure you plan ahead. You might think it’s a waste of money to heat your home while it’s empty when you’re on a vacation, but it will help you avoid a frozen pipe. Set your heater no lower than 50°F so that you don’t run into any problems. If you do run into a frozen pipe then it’s important to call a professional. We can help you handle any problems responsibly and in a fashion that won’t negatively affect the rest of your plumbing. Now isn’t the time to scramble for solutions from how-to articles online—frozen pipes quickly lead to burst pipes. Sometimes the frozen area isn’t always accessible too. Our team can handle anything and everything that you need, and we’ll do so for the best price available in the Greater Bloomington Area. Want to avoid a burst pipe? Contact our team today at Pipeworks Inc.—our technicians are always trained, conscientious, and reliable.